But first, we researched. We wanted to hear from people who’d been affected by scams. We recruited people who had contacted us about scams, either through our contact center or Facebook. We spoke to 32 people, who shared their experiences with scams. 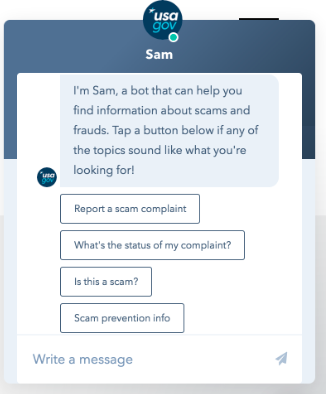 They didn’t just tell the facts about reporting the scam. They also spoke about their emotions and motivating factors for reporting. figuring out how to recover money they had lost. In the second workshop, we sketched ideas to address the most common concerns. After two rounds of sketching, we voted on the ideas that seemed most useful and viable for USAGov to create. This session led us to believe that a personalized experience might lead to better outcomes for our users. And thus the idea of our chatbot was born. Before building, we created a flowchart to map out all the responses and navigation. This was key to directing users to an answer for their problem. Since we wanted Sam to be personable, we wrote friendly and empathetic messages. We learned that our marketing automation tool offers chatbot building capability. This expedited the time to launch, at no extra cost. 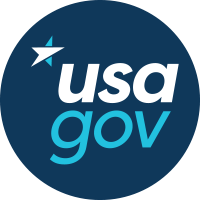 In early February 2019, we launched the bot on three USA.gov webpages. In over a month we’ve had over 4,000 users, and 78% have successfully asked their question and gotten an answer. Integrate with our contact center, to answer basic questions.